As 2017 draws to a close, I find myself asking myself personal questions about the past year. New Year’s resolutions are full of generic wishes, and in answering the six questions below I discovered more to inform 2018 by looking back at 2017. What was one of the moments I was most proud of this year? What does that tell me about what I want to spend my energy/time/money on next year? 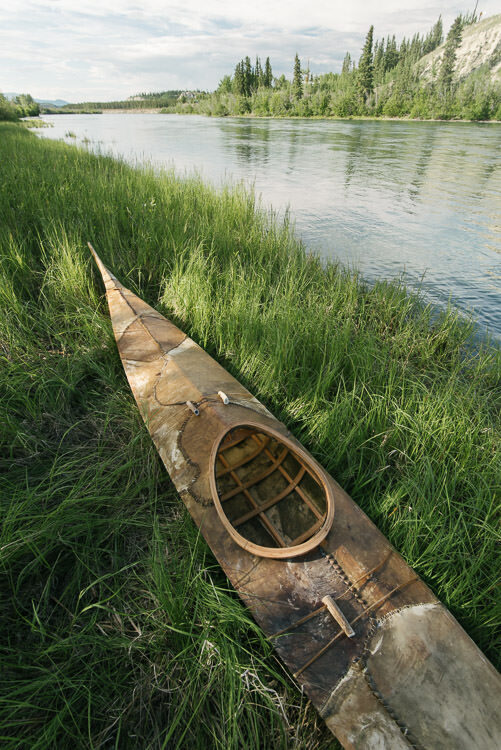 For those that don’t know, I am an indigenous kayak-builder as well as a photographer. I was both proud and awed by the launching ceremony for Dan Kwanje A-naan, the Indigenous Boatbuilding Project brought together by the Yukon First Nations Arts Council. It was a beautiful moment to see our kayak with three other indigenous boats, and to hear elders speak about them with tears in their eyes. Several elders said they had only heard their parents speak of the boats, and had never expected to see one in their lives. That was a beautiful moment for me, and reminded me that being a part of the indigenous cultural renaissance is something that remains deeply important for so many people who have gone through so much. Who really enriched my life this year in a big way? Who is someone I am wanting to get to know better in the year ahead? It might be a cop-out to say my partner Addie, but she has certainly enriched my life greatly this year. Aside from being a supportive partner and a great friend, she also has helped me with the big ideas that I’ve been writing about and helped me to clarify my own thinking on issues of indigenous perspectives, rights, and identity. She’s always there to edit my initial grand notions into sensitive and cohesive understandings of the world. There’s not a single person that I am looking forward to getting to know—I spend too little time with my friends and family with all the traveling I do in a year. Nevertheless, I look forward to spending the next few years sharing experiences with my brother again, who has now finished his medical residency and has time to be a human being again. It was a year of resistance for many people. What did I resist most effectively? What did I surrender to? This year I spent the most energy resisting the polarized platforms that Americans seem to be coming from. I champion the viewpoint that humans can solve their problems most effectively by looking at the way indigenous people have solved them for millennia. Who did I feel most jealous of this year? What is that person up to that I want to bring more of into my own life? I think I was probably most envious of my friend, photographer Patrick Wack, who I met this year at the Review Santa Fe. His body of work on the ongoing colonization of Western China brought me to tears and struck such a deep chord in me that I certainly wish that I had shot it. One thing that Patrick does that I love is that he grants himself 3-week sessions to explore and find documentary stories through photography. He approaches those projects less conservatively than I do as well, bringing along film cameras and wandering more than I do. I like that he can do excellent projects in a shorter period of time than I can, yet still come out with excellent work. Also, he speaks German, English, French and Mandarin. Me, on the other hand, I’m learning Russian, but slowly and poorly. When was I most physically joyful in 2017? How can I get there more in 2018? I was certainly the most physically joyful while paddling the kayak we built for Dan Kwanje A-naan with the other boats on our initial voyage. I got to listen to the Maori Waka canoe chant and beat the gunwales with their paddles, and it got me fired up to feel it in my body. Aside from that, I have to admit my favorite thing has been bouldering at my home rock gym. I miss climbing since I’m away so much, and it feels terrific to use my body to its fullest. This year I am forcing myself to stay home more and to plot out my climbing adventures even when out on the road. That should help keep me in shape. What is one question that you found yourself asking over and over again this year? What version of an answer are you living your way into? I think the biggest question for me this year is what my next major project is and how to approach it. The hurdles are to find stories that are both photogenic and tell the story of indigenous peoples living close to the land. It’s hard to find ones that don’t require mastery of new languages or expensive logistics in foreign countries. My current solution is to just go with the stories I feel really drawn to, and try to learn the skills I need to accomplish them, or perhaps hire people to help me in my endeavors to fill in the gaps. This requires money, so I part of the answer is more grant-writing, more institutional support, and diverting money from my equipment budget to making stories happen. What makes me despair and what gives me hope right now? It gives me despair to see the idiots of the world running the show based on ignorance, greed and prejudice. Nonetheless, I see lots of hope in the bigger picture—for indigenous peoples everywhere there is a resurgence in traditional practices, and there’s a renewal of interest in good journalism, though I think it is mainly in podcasting at the moment. I also despair that humans seem to be so disconnecting from the natural world as they keep urbanizing. I can’t see a light at the end of this particular tunnel, but I think that might be a lack of imagination—I have faith that people will start to come to the realization that without nature, life isn’t much worth living. The hope comes from the amazing beauty I see left in the world.